Amy discusses the origins and success of Windy City Gay Idol. She gives many props to all that have helped create and continue to keep this event going strong. 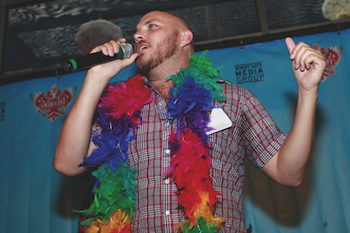 Guest: Windy City Gay Idol Winner Robert Hughes sits down with Amy on this Queercast. Robert shares his music inspirations and early life as a Tennessean. He has just moved to Chicago and gives us a little insight to his life, why he moved here and his love of music. Get to know our new Gay Idol winner for 2012! Music Featured on This Queercast: Emperors - "Be Ready When I Say Go" and JJAMZ - "Heartbeat"